It was long gone before I was born, let alone aware. 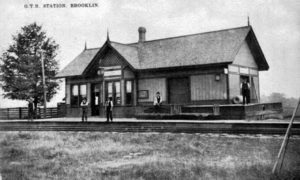 Brooklin once had a railroad and perhaps, to our town, it became a legend. I first became aware of it when crossing its old bed with my older brothers and sisters to reach a meadow that we played in, part of the farm across the road from where we lived. Later, when I was older, we used some of its old railway ties to build forts and, up closer to where the old bed crossed the 7th concession, apple trees grew wild. This was the PW&PP Railway, (Port Whitby and Port Perry,) as it was first known as and then later, unofficially branded by the locals as the ‘Nip and Tuck’ line. Conceived as a possible rival for the ports in Toronto, allowing goods and farm produce from the expanse of the now Durham and Kawartha Lakes area to be shipped directly out of the Whitby piers, it ran from just about dockside in Port Whitby, up to Port Perry and, initially, had stations in Whitby, Brooklin, Myrtle, Manchester, Prince Albert and finally Port Perry, the last three developing towns being locked in an intense rivalry of politics and business aspirations. Later, after it had been extended all the way up to Lindsay, it became known as the WPP&L Railway. (Whitby, Port Perry and Lindsay.) With that extension, more stations were added; Seagrave, Sonya and a station for Manilla Junction which was actually located just north of the little town of Cresswell, where the line turned sharply east, forging its way towards its terminal station in Lindsay. Later, a further shunt line was built, heading southwest, to connect to the newer T&N line immediately east of Blackwater. The sod turning ceremony took place on the 6th of October, 1869 and was conducted by Prince Arthur. The southern portion, although slowed by a bankruptcy and an unplanned railway gauge conversion, was completed on the 31st of August, 1870. 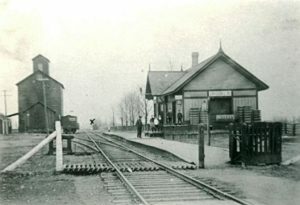 The first train arrived in Port Perry in the spring of 1872. One says it was called ‘nip and tuck’ because it was operated ‘by the seat of its pants’ and the other because it was questionable whether or not the train, on any given day, could actually power its way through a tricky, high grade section of track that wound up through the Oak Ridges Moraine, between Myrtle and Manchester. From the various stories that have circulated over the years about its operation, both seem to fit remarkably well! The section from Port Perry to Manilla Junction was abandoned in 1937 as the traffic from Lindsay was directed west to the newer T&N line. Sadly, the rest of the south running line was pulled up in 1941, with its steel going into the war effort. Ironically, the last working section of the WPP&L line was used to run freight from Lindsay, down to the T&N line and from there to Toronto. The line is gone but in the old-timers of Brooklin, the legend remains.